Feathers are made up of keratin, a very strong protein also present in our hair and nails. 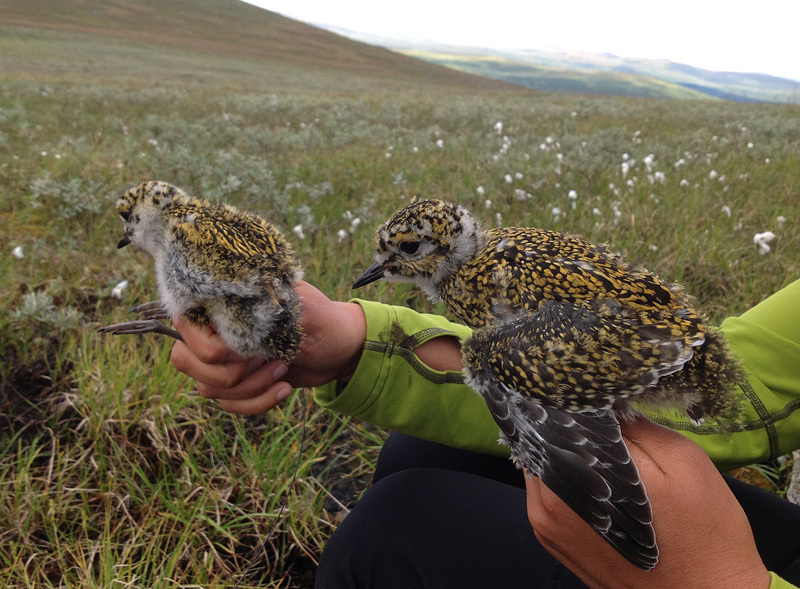 Only covered by down in their first days after hatching, Golden Plover chicks produce thousands of new feathers during the pre-fledging period. Contour feathers will cover their body to help thermal insulation and waterproofing, and finally wing feathers will give them the power to fly. Juvenile Golden Plovers are very easy to recognise in the field. With fresh golden feathers on back and wings, lacking dark belly and face tipical from breeding adult plumage. 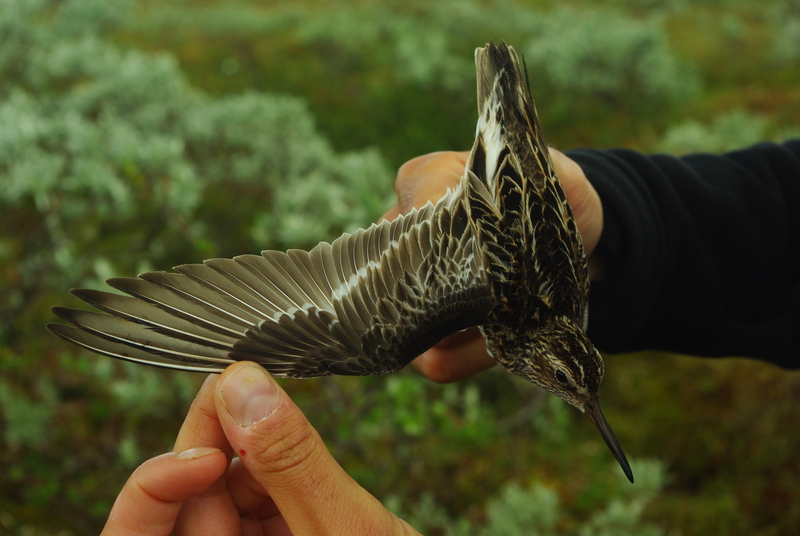 However, once adult birds moult into winter plumage, the differences are almost imposible to detect. Ground-dwelling arthropod abundance has dropped in the last days. 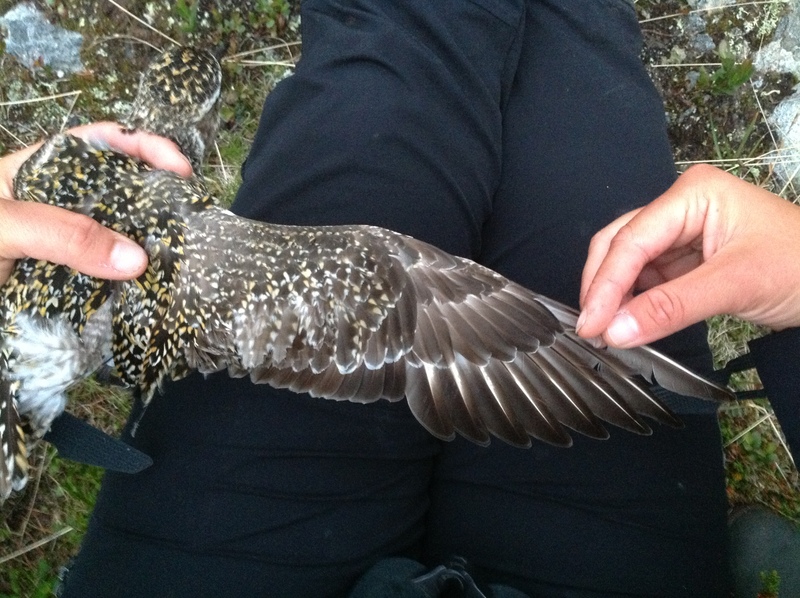 However, berries are starting to mature and Golden Plover chicks will defenitely go for them. Moreover, with their now longer bills they will increase their feeding range, probing under the soil surface in search of larvae and other hidden invertebrates. 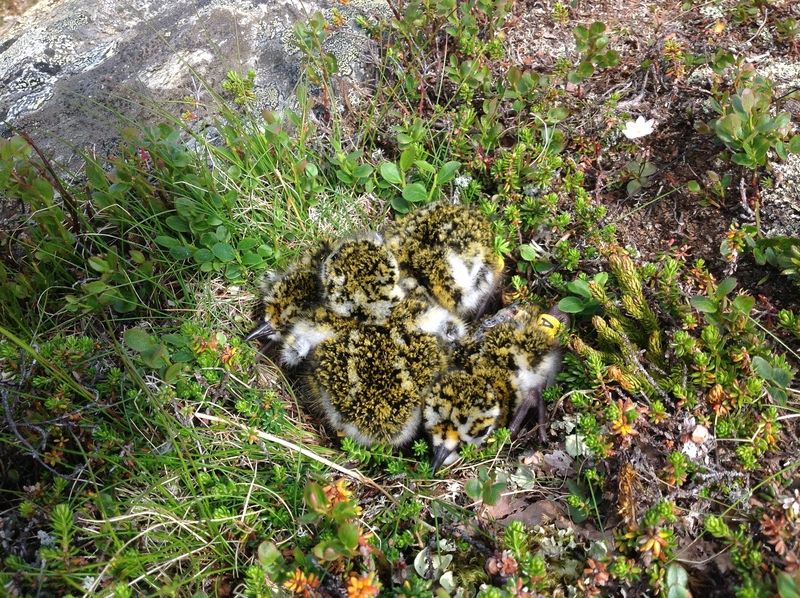 The first Golden plover chicks have finally hatched in the area..! After hatching they will leave the nest a few hours later and start wander around feeding by themselves. Being protected and brooded by both adults, the female will eventually leave them after two or three weeks but the male will stay with them until fledging, a month later. Yellow is coming into fashion this summer..! 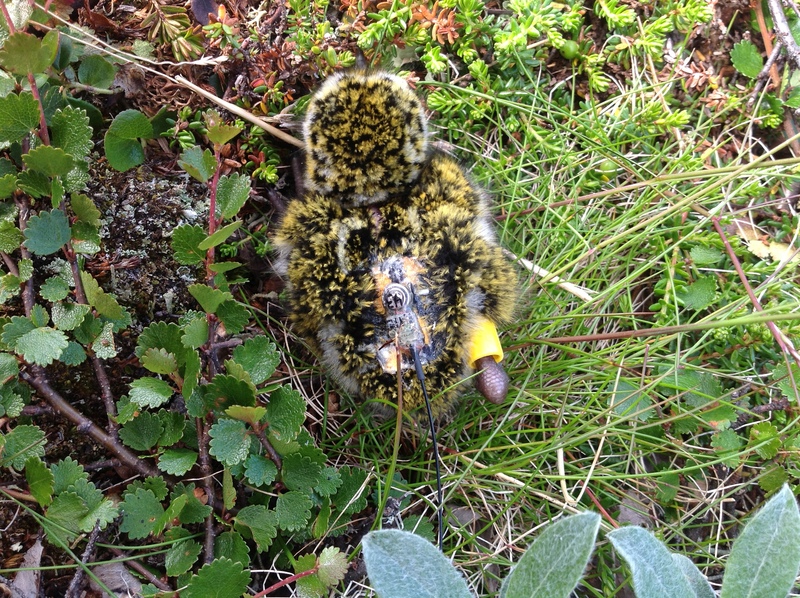 As you may remember, in 2011 we colour-ringed Golden Plover chicks with green rings. This season we will use yellow rings instead to keep track on them to study survival and natal dispersion in the next years. Additionally, we will radio-track one chick of each brood during the whole pre-fledging period. During a nest control, we surprised an adult incubating very still on the nest. Sometimes, since they trust so much in their cripticity, it is even possible to trap them directly on the nest. This was the case for this not common visitor in our study area. Broad-billed sandpipers (Limicola falcinellus) that breeds in Fennoscandinavia winter in east Africa, Pakistan and south India. 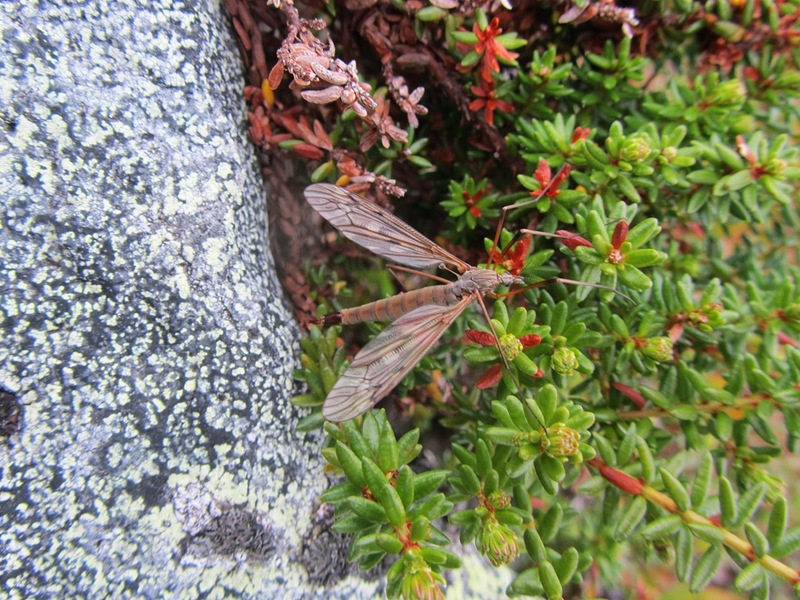 They normally breed in lowlands zones, not been usual to find them up in the tundra (see here). There has been recorded some individuals breeding in our study area during recent years, but it is for sure not a common species. After some days, we visit the nest again in order to ring the recently hatched chicks. They were been brooded by the adult when we arrived and right after we left we could observe the adult retuning inmediatly to continue given the warmth they need during their first days of life. After having found a good number of nests in the area, we have started to try to retrieve lightloggers placed in 2011. Some of this trappings need to be performed during the night, since females mostly incubates at night time, while the male, as a “sentinel” check out for possible dangers. We did not have many chances, since some nests which adults had a logger have been very soon predated. However, we manage to recapture 2 so far. They belong to a pair, one male and one female, that came back last year 2012 and again this year. 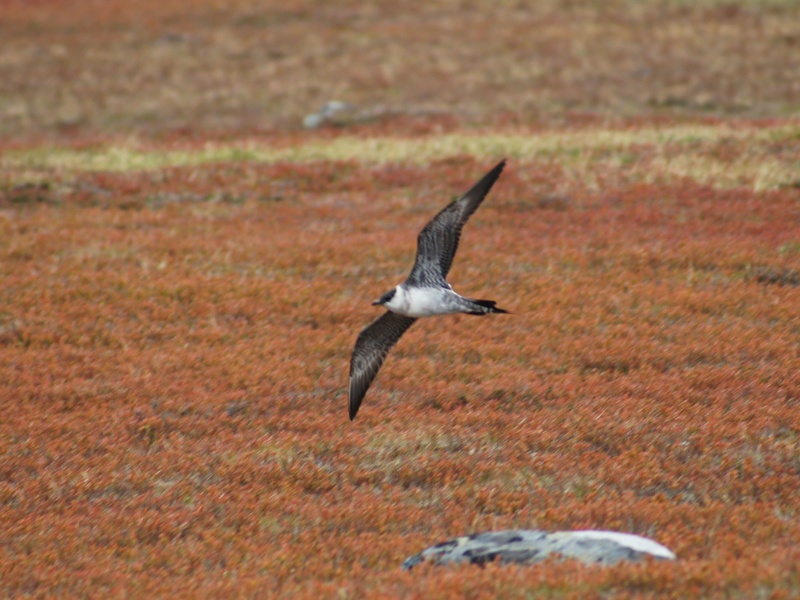 We dont know for certain if they manage to breed in 2012, but this year they bred very close from 2011 nest (30m). One of the loggers contains 2 years data, so hopefully we will be able to see where they actually meet and if they indeed leave the area together. Most resightings of colour-ringed Golden Plovers in the area are from birds ringed as adults in previous years. 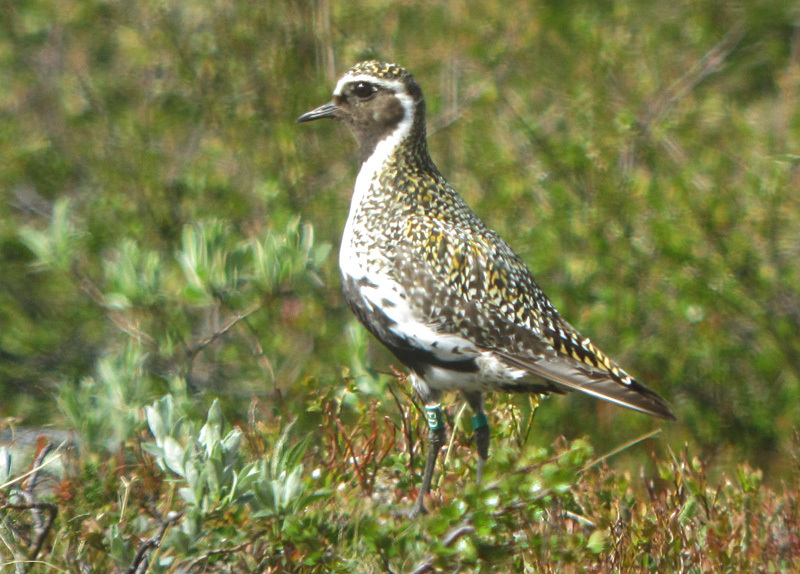 However in 2011 we colour-ringed some tens of Golden Plover chicks in the nest with green rings and an engraved two-letter code for individual recognition. Last year we had very few resightings due to the odd breeding season caused by the late spring and most of them were observed down in the delta feeding in the meadows while their breeding grounds were still snow covered. 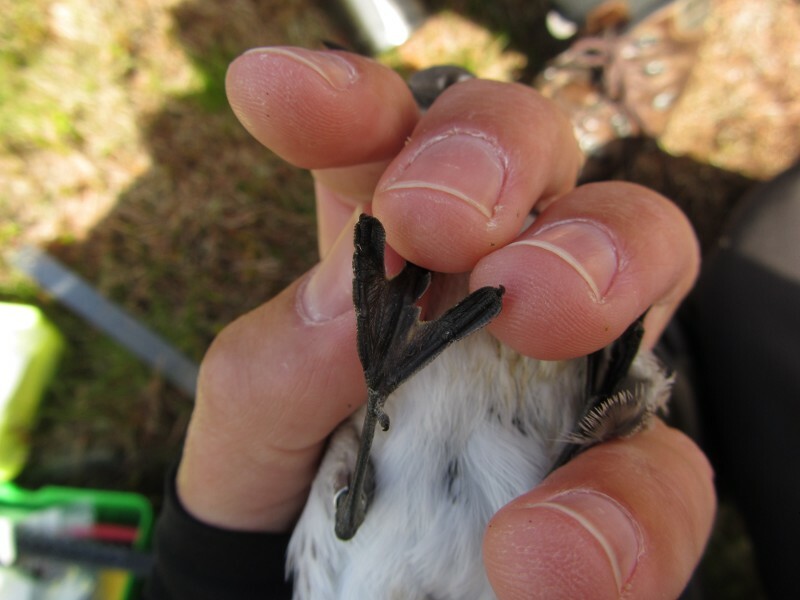 This season, so far we have observed 5 of those birds ringed as chicks in 2011 in the same area where they were hatched, demonstrating the philopatry of the species. We still hope to have more observations of those birds during the rest of the season and keep track of their breeding. 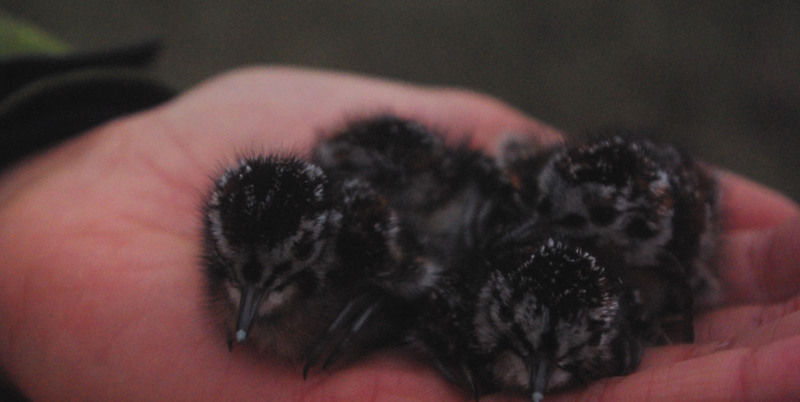 In the meantime, we have been catching Red-necked Phalaropes to equip them with geolocators. Red-necked Phalaropes appear to be not as site-faithful as, for example, Long-tailed Skuas, so in order to increase the chance of getting recaptures (necessary to read out the data), we only place them in ‘phalarope-heaven’. Gelmetje, that is. 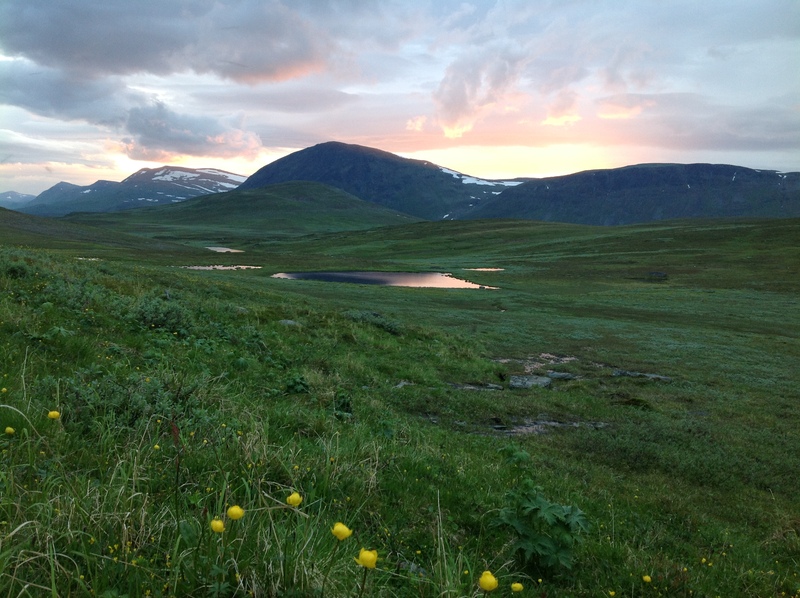 This is a small tundra area, squeezed in between the wet valley Marsevaggie in the west and the Vindelälven river valley in the east. It is full of small ponds, partially overgrown with floating Carex vegetation. As you may remember from last year, we recaptured a breeding male phalarope in 2012 that was ringed at the same place in 2011 as a chick. Today, we recaptured it again, just a few hundred meters further west! It was kind enough to show us its nest while we were looking at it from about 10 meters! 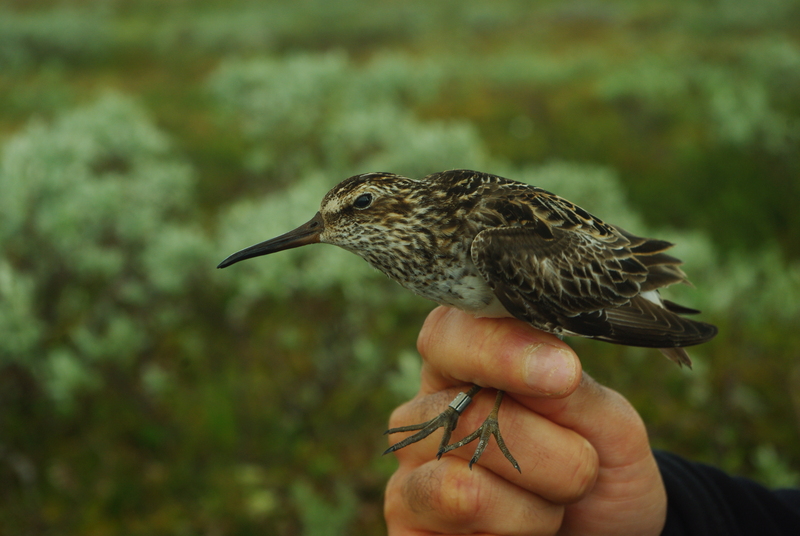 We also recaptured another phalarope that was captured in Gelmetje last year. This is promising, as it shows that at least some individuals return to the same area. Now lets hope they return next year with a logger full of data! Phalaropes have webbed feet for paddling.